Yet another cloudless morning dawned after a lengthened night listening the blasted dog next door again. Despite having aching thigh muscles from yesterday’s walk around the Sierra Bernia and being a little shorter of sleep than we might like, we decided to make the most of the weather and try to do the ascent of the Peñón de Ifach, the 332 metre high Gibraltar-like rock that overlooks Calpe. 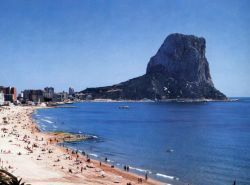 There are two paths here to take; one leads to a viewpoint at the most easterly point of the rock, the other is the ascent to the top towering above Calpe. The path up to the summit is a hands-and-feet scramble/climb in a few places and doesn’t seem to be for the faint-hearted. It’s best not to look down. Since the footing is a little precarious, it’s also best to stop before looking anywhere other than at your feet. Once at the top, however, the views were impressive and it was well worth the effort. Certainly, the two cats we discovered at the very top seemed to appreciate it. After some obligatory photos, it was time to brave the decent with our thighs beginning to yelp after this on top of yesterday’s effort. We were grateful for our Leki walking poles which made us feel a bit more secure. We reached the bottom at about 2:45 PM and popped into Calpe’s bright new Mercadona supermercado before returning to to take Scamp, el perrito, for a swift wander into Jalon for yet more exercise.